NET.Notes system as such and its individual modules contain functionality hidden beneath seemingly inconspicuous buttons. 1. 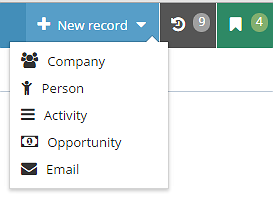 On top menu you can find the dropdown button which allows you to quickly create some basic documents, like new company profile, activity, or send email. 2. In Contacts you can find a link to show up company address on Google maps or you can check company information form Bussines register.